Science fiction is a handy genre: it is possible for people who doesn't really know much about it to transpose another genre (western, horror, detective) unto it, look cool in the process and make a bundle at the box office. It is seldom that a "pure" science fiction movie gets made without all kinds of genres transposed unto it - take Star Wars for example, which is a pastiche of every movie genre known to mankind. It is not one movie, but all movies, thus falling perfectly under egghead Umberto Eco's definition of a cult movie. "Despite the plot's limitations, director Ridley Scott pulls it all off with amazing visual aplomb . . ."
Alien is a horror flick set in outer space. The old haunted house is the giant space ship Nostromo. The monster is a vicious (a truly original) alien designed by Swiss artist HR Giger. The teenagers in the old house are the ship's crew: Sigourney Weaver, John Hurt, et al. Predictably the alien kills them all off until only a lone female crew member remains. Much has been made of the Alien movies being feminist. This is true to an extent, in that its female protagonist Ripley (Weaver) doesn't wait and hang around to be rescued by a male. Instead she does the Rambo thing herself - particularly in the first sequel (Aliens) - and blow away those alien mothers herself! But the plot device in the first Alien movie is one that has been done the year before by Jamie Lee Curtis in Carpenter's Halloween horror movie and every subsequent slasher movie from Friday the 13th to Nightmare on Elm Street. However, despite the plot's limitations, director Ridley Scott pulls it all off with amazing visual aplomb - having made his debut in the advertising business, Scott has got that 1980s "look" to all his movies. 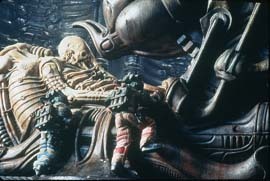 This film is no exception: first there is the stunning designs by Swiss artist HR Giger. His stuff is like the Surrealists on a really very bad day. Giger and Scott creates a sense of unease by placing human protagonists against an alien and surreal backdrop - one of the basic ingredients of sci-fi. Both the Nostromo and the alien world where the alien gets picked up are strange and unforgettably original. Claustrophobic, the Nostromo is grimy and dark - continuing the tradition set by Star Wars and 2001 of giving the viewing public space ships that look like they might actually work! Add to this stunning special effects and an alien brought to life by special effects wiz Carlos Rambaldi (who later designed E.T.! ), brooding music by Jerry Goldsmith (Oscar winner for The Omen) and it is not difficult to see why the movie has achieved both the cult status and box office success it did . . . a hit with both horror and sci-fi fans, it spawned three sequels: Aliens (in 1986), Alien 3 (1992) and Alien Resurrection (1997). Read our review of Alien on DVD.